Ribbons are the best option to be used for various decorative and craft purposes. The grosgrain ribbon plaid sweetheart print is easily available in several designs, styles and patterns along with different dimensions. These gorgeous looking ribbons could be used for getting done with your craft projects. Well, if you want, these can also be included in the activity time of your little ones. 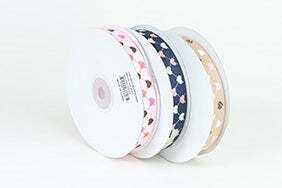 They can actually show their creative bent of mind with these cute looking grosgrain printed ribbons. We offer the best quality material at reasonable rates. This is a big reason for which most of the people love shopping ribbons and other supplies at BB Crafts official website. The grosgrain print ribbons we provide are of the most superior quality, and we assure you to deliver exactly the thing you ordered for. We specialize in offering the best wedding and craft supplies in almost every shade that can be imagined. So, browse our website and grab all you need at nominal rates.